The car rental companies will tell you not to travel around West Maui's rugged north shore. Although narrow and winding, the road is paved the entire way. Perhaps the problem lies more in the fact that if you were to break down, getting service would be hard plus the road can be dangerous in bad weather with flooding and falling rocks. The drive itself is absolutely breathtaking, in some ways more impressive than the Hana Highway, which gets much more publicity. From Kapalua to Wailuku you pass some of the most rugged coastline in the world and some very lovely beaches and bays which are not well known or frequented. The small, sandy beach here is nicknamed Slaughterhouse Beach, not because it's dangerous, but because the Honolua Ranch, which sits above the bay, once had two slaughterhouses on the ridge. The slaughterhouses were torn down in the 1960s but the name remains. The second bay you'll come to in the Mokuleia Marine Life Conservation District is Honolua Bay. Once again you'll need to park along the road or in the small turn off. The beach lies between mile markers 32 and 33 on Highway 30. After a short walk through the jungle and past some feral cats, you'll come to the shore. There's no real beach here, just a lot of rocks, but that doesn't mean that this is not a great place to swim. The snorkeling and scuba diving here are excellent, especially near the cliff faces. You'll need to be careful crossing the rocks and entering the water. Conditions here are best in summer. In winter or after a heavy rain, you're best to just enjoy the view here from the lookout area at Lipoa Point, just up the road on the left. The views from the lookout area are superb as you can see from our photo. After a particularly heavy rain, you'll notice that the water as far as you can see to the south is a muddy red due to runoff from streams. Up the cliff from Honolua Bay, you'll notice pineapple fields on your left stretching out to the ocean. This flat plain was home to a golf course in the 1940s10-mile it's nickname of "Golf Links." Right before the fields, there's a dirt turnoff and a dirt road stretching to the coast. Usually, you can pull into this road and park. In good conditions, you can even drive down the road a bit. Don't try this when the road is muddy. You're actually venturing onto private property here, and Maui Land & Pineapple has tried to cut off access in the past. 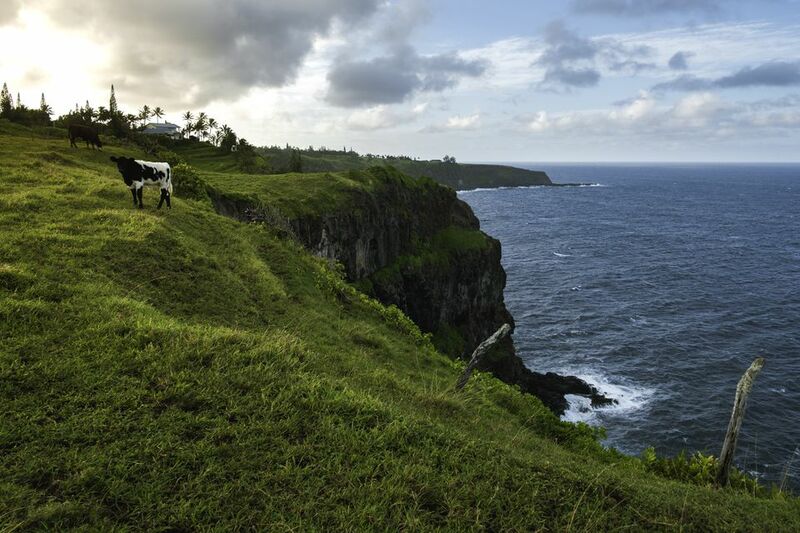 A walk down the road provides superb views back towards Honolua Bay. You'll also find great views at the end of the road of the coast. There are several erodes paths that lead down the cliff face to small beaches below. These are mostly used by local surfers and swimmers who know where to step and where to avoid. From above you'll see tidepools, hollowed out caves, natural arches and clear snorkeling and soaking pools. On the other side of the pineapple fields, you can pull over and get a view of the next beach Punalau Beach. The actual beach is located down the hill at mile marker 34. This beach is referred to by many names, You'll also see it referred to as Pohakupule Beach, Keonehelele'i Beach or Windmill(s) Beach. The name "Windmills Beach" derives from an old windmill that used to be nearby that drew water for the Honolua Ranch. The There are is long gone. This rocky beach is about 100 yards long and not clearly marked. Look for the "Private Property" sign on the left. There's a dirt access road for the beach near the sign. The beach itself is lovely. Trees and steep rocky slopes surround the beach. The sand on this beach is a mixture of white sand, small grains of black lava and shells of all sizes. Coral and rock flats extend about 100 yards from the shoreline. The beach is a popular launching point for kayaks used for fishing. In the winter months, it's a popular surfing beach. The wave break is produced by a ridge that extends about a mile offshore. This land is also owned by Maui Land and Pineapple and for a small fee, they allow folks to camp here. There are no facilities available. As with most of these north shore beaches, they are potentially dangerous during heavy winter storms. As you travel along the highway around the next bend, you'll see the next beach down and to your left. This is Honokohau's Boulder Beach at mile marker 36. As the name says, the beach is entirely made of boulders. There is room for about 25 cars to park here. This is a popular surfing beach during the winter and lots of locals frequent here. Car theft is high here, so do not leave any valuables in your car if you walk to the beach. This is also a popular spot for kayaking and the last spot on the north shore where boats can enter the water. When winter storms hit, the waves and surf here are very dangerous due to the rocks. The Honokohau Stream enters the bay on the south end of the beach. Beware of flooding during or after heavy rain. Nakalele Point is the most northern point Maui. It is located just past mile marker 38. You can't miss the parking area since there is usually a lunch truck parked here. Scattered across the field are numerous "cairns" or rocks piled by visitors along with natural rock formations. The primary attraction here is the famous Nakalele Blowhole, located about 1200 foot along a clearly defined path. If the surf is heavy, or it's high tidean you'll actually see the geyser effect long before you reach the blowhole. Nakalele Point itself is marked by a light beacon which you'll pass. You'll also walk past numerous tidepools along the shore and beautiful lava rock formations. The blowhole is created when the pounding surf undercuts and wears away a shoreline lava shelf. A hole in the lava shelf causes a geyser-like effect which can reach over 100 feet when air and water are forced upwards through the hole. While it may seem tempting to approach the blowhole for a great photo opportunity, don't do it. People have been killed as they get sucked back into the hole by the retreating water at this and other blowholes in Hawaii. A second viewing area is less than 1/2 mile past Mile Marker #40. This is a smaller pullout and you are only a few feet from the overlook. The third overlook is a little farther down the road where there is a larger pullout. Walk about 100 feet to this overlook. From these overlooks, you'll also get a great view of Kahakuloa Head to the east. You'll notice that the highway markers no longer read Highway 30 (Honoapi'ilani Highway), but now Highway 340 (Kahekili Highway). Beginning with mile marker 16.3 the mileage shows in descending order. Right before mile marker 16, you'll see a huge boulder near the road on your right. This is called "The Bellstone." This boulder is reported to sound like a bell if struck in the correct place on the right side with another rock or stone. After the Bellstone you'll see a dirt road leading to the "Olivine Pools," a natural lava formation that creates pockets of water in the rocks when the surf is calm. The lava has small pieces of the semi-precious gem olivine encrusted in the rock. The road begins to narrow and heads back down towards sea level. Keep your eye out for mile marker 15 and the scenic outlook nearby. From here you'll get a fantastic view of the village of Kahakuloa. There's also a spot on the other side as you climb back up the mountain where you can view the village. Kahakaloa is a small isolated village at the end of a valley. The village is home to about 100 people and their homes, two lovely churches, and several road-side stands including the Panini Pua Kea fruit stand and Ululani by the Bay, a pink cart with sodas and snacks run by Ululani Ho'opi'i, wife of recording artist Richard Ho'opi'i of the Ho'opi'i Brothers. You won't find a gas station or restaurant here, but you will find very friendly people. After you climb the hill on the other side of the village, keep your eye out for the Kaukini Gallery and Gift Shop on the right-hand side of the road. Maui artist Karen Lei Noland started the gallery on the ranch that once belonged to her grandparents. Here you'll find selections of Noland's original paintings and prints. The Gallery exhibits the hand-made works of over 100 local artists from Maui and the other Islands of Hawai. In the Kaukini Gallery Collection, you will find paintings, ceramics, jewelry, koa woodwork and prints. It's a great place to shop for that special souvenir or gift from Maui. The views back into the valley from the parking area are spectacular. You're likely to see some cattle grazing on a distant hillside. hairpin The view of it henine-milere, however, is less spectacular than those you get as you approach from the other side of Kahakuloa Village. Kahakuloa Head is 636 feet high and is best known historically for King Kahekili's Leap. In the mid-1700's Maui's last independent rule, King Kahekili, the chief rival of Kamehameha I. spent time in this area. Legend says that in the early morning, the King would climb up the hill and "leap" into the ocean below from about the 200-foot height. There is a trail leading to the top of Kahakuloa Head, but it is very narrow and dangerous to traverse. As you leave Kahakuloa Head, the road moves further inland. You'll see rolling hills on your left and right with numerous cattle grazing, The road here makes some tight hairpin turns, so drive carefully. Keep an eye out to the left and you'll find a spot where you can see Mokeehia Island off of Hakuhee Point. This island is a seabird sanctuary. You'll need an excellent pair of binoculars to see any birds, however. You'll also start to see more houses along the highway. Just after the 10-mile marker, you'll pass the Turnbull Studio and Sculpture Garden on the left. You can't miss this since there is a huge gate over the entrance and large bronze and wood artwork and statues in the lawn which are visible from the highway. It features the work of Bruce, Christine and Steve Turnbull as well as other local artists. Just after the nine-mile marker, you'll see the Aina Anuhea Tropical Garden. There are some nice gardens here and two lovely waterfalls. It's a favorite spot for weddings. Your trip across West Maui's Rugged North Shore is almost complete. From various places along the highway, you can see the Kahului coast in the distance. You've seen power lines for the first time since you left Kapalua and now, you get to see another first, your first waterfall along the highway. Unlike the Hana Highway with its numerous waterfalls, this drive is noted for its stunning panoramic views, wonderful beaches ​and rustic beauty. Just past mile marker ​8, you can see a waterfall down below in a small valley to your left. This is Makamaka'ole Falls. Depending on the rainfall, the waterfall is either easily visible or hardly noticeable at all. It is a two-tier waterfall. Often the lower part of the waterfall is visible even when the upper level is not. Very soon you'll pass through Waihe'e ​where there is a great hike to consider through the rainforest of the valley. The best way to do this hike is with Maui Eco-Adventures. They also offer hikes elsewhere on Maui including through the area of West Maui covered in this article. Before long, you'll find yourself in the Central Maui town of Wailuku from where you can head back to West Maui by the usual and quicker way.